Liu Sanjie (The Third Sister of the Liu Family) is a legend of the Zhuang people. Zhuang is one of the 56 ethnic groups in China and, with a population of 15 million, is second only to the Han people. The Zhuang people believe that the legendary Liu Sanjie actually existed. It is said that there was a beautiful village in the mountainous at the common boundary of Luocheng and Yizhou (two counties of Guangxi Autonomous Region). A Zhuang girl was given birth in the village. She was called Liu Sanmei (it was the original name of Liu Sanjie, since she was the third child of Liu family). When she was a little child, her parents were dead and she was brought up by her elder brother. Her family is poor and lived on fishing and weaving. Little Liu Sanmei was clever and was very good at weaving. What's important, she already had a melodious voice. So she was believed to an incarnation of a lark by the Zhuang people in the village. In her teens, she was regarded as the top singer of folk songs - songs in an antiphonal style, typical of the ethnic people in South China. In daily life, Liu San used her wonderful voice to sing, to express the villagers' thinking and disaffection. A local tyrant named Mo Huairen felt offensive. Coveting her beauty and talent, the tyrant wanted to have her as his concubine. He hired three 'skilful bookman singers' and wanted to beat down Liu Sanmei on the local song contest. But he failed. Rejected repeatedly, the angry Mo played booty with local officials and plotted to murder her. With the help of her boy friend and fellow villagers, she managed to escape. Liu Sanmei and boy friend were forced to move along the Dragon River to Liuzhou. Then they temporarily settle down in a cave of Yufeng Hill in Liuzhou. The two lovers traveled as they sang, their wonderful voice echoed around the Yufeng Hill, which was heard and appreciated by goodness on the heaven, and admired popularly by local people. Unfortunately, this was not so long, Liu Sanmei's trace was learned by the tyrant Mo. Mo used a lot of money to collude with Liuzhou's officials. Then Liusanmei was besieged by official soldiers in Yufeng Hill and was in danger of seizing. Local people wanted to fight with the official soldiers to save her, but Liu Sanmei didn't want the people to get involved in. she and her boy friend were forced to jumped into the deep pool of Liu River, and eventually found their ultimate freedom by turning themselves into a pair of larks. That is a touching legend about Liu Sanjie. 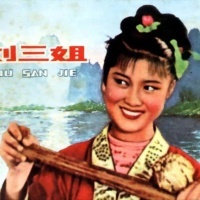 Nowadays, the cave Liu Sanmei lived is named 'Sanjie Cave'; and local Zhuang people always gather along the riverside of the Liujiang River and organize a folk-song competition on the day of March 3 to commemorate Liu San Jie. Studies show that the legend is not exclusively of the Zhuang people. Its spread turns out to be more ethnically and geographically diversified.